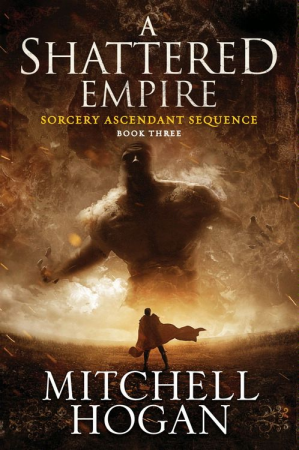 After a brief prologue, A Shattered Empire, the final volume of Mitchell Hogan’s Sorcery Ascendant Sequence picks up minutes after the last volume ended. Things are looking dire for the Mahruse Empire, and possibly the world as a whole. An evil sorcerer leading a massive army has taken over the city of Anasoma, bloodthirsty creatures of legend are still on the march, a sorcerous weapon has knocked the Emperor’s forces into disarray, and a strange band of mercenaries have offered him their support. While various factions vie for power or cover their backsides, a bunch of disparate heroes, all with their own agendas, still have their eyes on the main game. Again the focus is on Caladan with occasional side trips to other (more interesting) POV characters. Caladan, the callow youth with strange powers of A Crucible of Souls (reviewed here), discoverer of dark secrets about his powers in Blood of Innocents (reviewed here) is now a powerful sorcerer in his own right. Caladan becomes through this book an agent of bloody vengeance, his trust and empathy stripped away as his powers grow. Fans of classic epic fantasy, and this series in particular, will enjoy the well-paced and lovingly described magical action and swordplay. But all of the characters, including Caladan, remain at a remove. It is difficult to care for them or about them as the plot twists and they either bicker and fight among themselves or reluctantly unite against a common foe. And without that connection, all that is left is the action. While this is the end of this “Sequence”, little of Hogan’s world has been been explored in this series. Practically all of the action takes place in or between the nearby cities of Anasoma and Riversedge. And the resolution, while satisfying in itself, leaves plenty of issues unresolved. So it would not be a surprise if Hogan returns to this world fairly soon.